Pitting the two Missouri teams against one another, the '85 Fall Classic was known alternatively as the I-70 Series and the Show-Me Series. The Series opened in Kansas City, but St. Louis captured a taut 3-1 decision as the Royals missed a number of excellent scoring chances. The Cardinals won again the next night, scoring four times in the ninth inning after being shut out the previous eight. K.C. 's only two runs came in the fourth. With the World Series shifting to St. Louis for Game 3, American League Cy Young winner Bret Saberhagen tossed a complete-game six-hitter and second baseman Frank White knocked in three runs to give the Royals a 6-1 victory. Cardinal ace John Tudor topped Kansas City in Game 4, however, with a five-hit shutout for a 3-0 decision and his second win of the Series. The Royals staved off elimination in Game 5, winning 6-1 behind the five-hit pitching of Danny Jackson. Game 6 won't soon be forgotten by fans of either team. After seven scoreless innings, the Cardinals eked out a run in the eighth, so the Royals still trailed 1-0 when they came up in the bottom of the ninth. Pinch-hitter Jorge Orta led off with a slow roller to first baseman Jack Clark, who tossed to reliever Todd Worrell at the bag, apparently in time to retire Orta. But umpire Don Denkinger called Orta safe. One missed pop foul, two singles, one out and an intentional walk later, pinch-hitter Dane Iorg drove a soft liner to right field, scoring Onix Concepcion and Jim Sundberg with the tying and winning runs. Game 7 featured both teams' aces, Tudor and Saberhagen. But while Saberhagen had his good stuff, Tudor didn't. In the bottom of the second, Royals right fielder Darryl Motley slugged a two-run homer down the left-field line, and the rout was on. 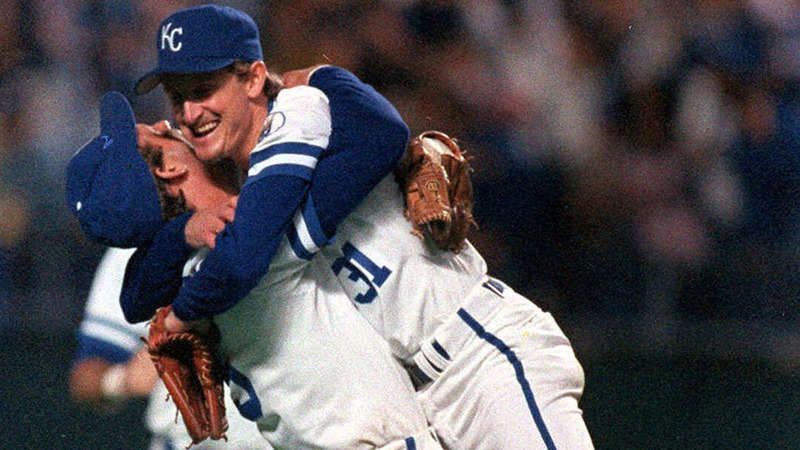 The Cardinals went through seven pitchers to no avail as Kansas City scored 11 runs and Saberhagen tossed a five-hit shutout, giving the Royals their first Series title.